This past weekend we made the three hour drive from the east coast of Florida to the west as a last hurrah before I return to work. This is an annual tradition of ours - in the past we've gone to Ft. Lauderdale, Michigan, Miami, and Cape Canaveral. When I started researching this years trips I had a few things in mind. I knew I wanted the west coast so that we could check "see a sunset" off of our bucket list. We were going to be driving over at night after the hubs finished work, so I didn't want anything farther than 3 hours. Sanibel seemed to fit the bill perfectly, it's an un-commercialized island so I knew it would be laid back and good for relaxing. So that's what I planned. Secretly. Did I mention that part? Hubs had no idea until he got home from work and we told him to get in the (already packed) car because we're going on our end of summer trip! 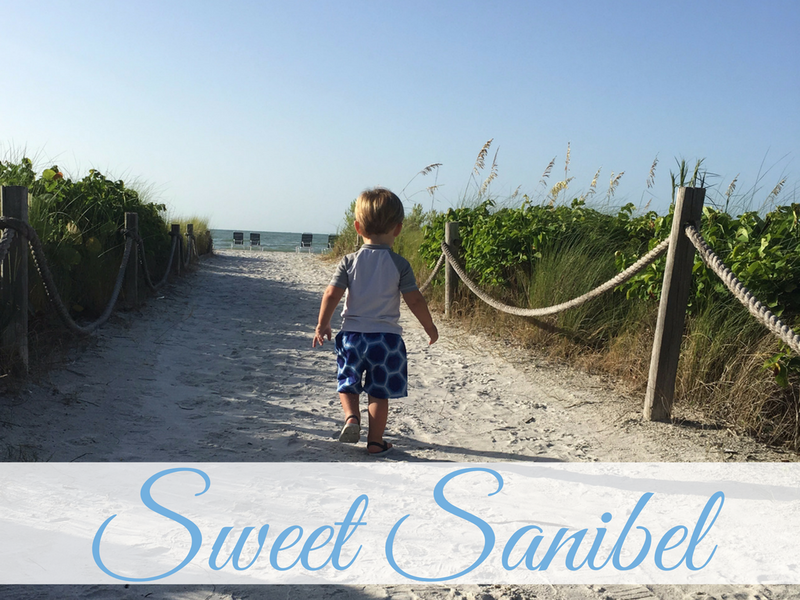 Here's how our weekend in Sanibel, with our 25 month old son went! We drove over and checked into our hotel, then rested up for the next two days. Holiday Inn Sanibel - I picked the Holiday Inn for a few reasons: 1. It was the most economical choice, 2. It was right on the beach, 3. The grounds were beautiful. They were lush and full of trees, hammocks for afternoon naps, and a pool in case you got sick of the beach. We had a second floor room that was clean and quite large, they provided juice and muffins every morning for breakfast, and they set out beach chairs for you. What more can you ask for in a beach hotel? This was our day to relax, spent mostly at the beach. Holiday Inn Beach - As I mentioned the Holiday Inn is right on the beach and they set out beach chairs for you so you don't have to worry about that. We brought along Jacob's little chair and spent the whole morning splashing in the surf, looking for seashells, and building sandcastles. We even saw some biologist going through a hatched turtle nest, and they found some live turtles who never made it out to the sea! We would have been content to stay there all day if stomach's hadn't started rumbling. Island Cow Eatery - After some quick showers to wash off the sand we headed out to the Island Cow for lunch. This is a funky little cafe with cow decor all over the inside, and some fun games and chairs outside. We chose to sit outside on the patio and several fans kept us nice and cool. They provide little ones with blank paper and a whole bucket of crayons which was perfect for keeping Jacob entertained while we waited for food. We ordered the crunchy fish tacos, Blackened Flounder sandwich, and the children's grilled cheese. All three portions were huge! Dan and I could have easily split my meal eating one taco each and if you have more than one kid they could definitely share a kids meal! They also provide you with a plate of muffins while you are waiting for your meal, so no one goes hungry here. After lunch we walked around the back where they have birds and a few games and signs. Nap Break - Little man was WORN OUT from his morning at the beach, so we headed back to the hotel and everyone got in a nap. He slept a full hour longer than usual and by the time he woke up it was starting to rain and was nearly dinner time. So we took the ride up to Captiva to sight see and get some dinner. RC Otters - Captiva is just north of Sanibel, connected by a bridge. 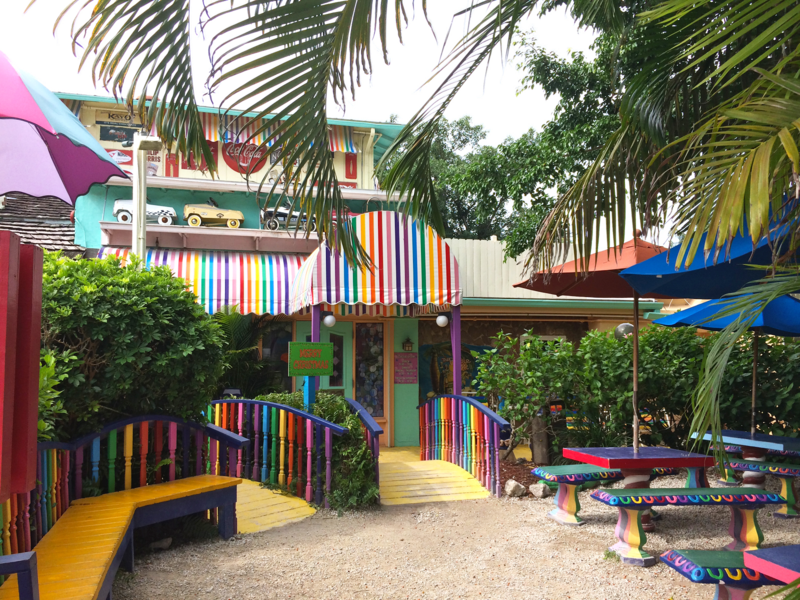 It's even more un-commercialized than Sanibel, consisting mostly of large beach houses and a few restaurants and shops. (No chains here at all!) 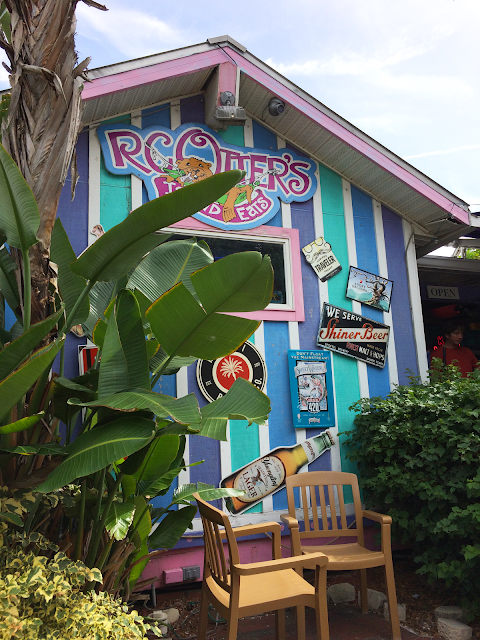 We drove up and found ourselves at RC Otters, a laid back restaurant in the middle of town. They had their tables covered in white paper and provided cups of crayons, so they get toddler points also! We had their crab cakes with rice and broccoli, french dip sandwich with chips, and kids hot dog with sweet potato fries and all were delicious and plenty of food. Both the crab cakes and the sweet potato fries came with a tropical mango dipping sauce that was so yummy. As we were leaving the rain was clearing and they were starting to set up live music, which is always fun! The Bubble Room - After dinner we wandered across the street to the famous Bubble room restaurant. 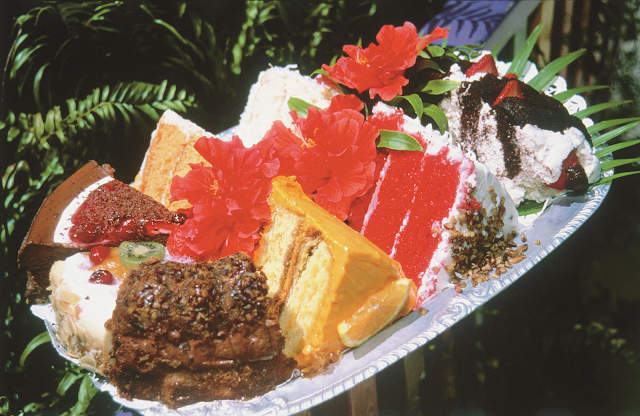 We played outside in the gorilla cages, took some pictures inside in the love boat and then got some of their famous cake to go for dessert later. The restaurant is very eclectic and packed full of fun knick knacks. Next time we come we'll definitely try dinner here too. Blind Pass Beach Park - On our way back to Sanibel we noticed that time was slipping away from us a little bit so instead of driving all the way back to the hotel we stopped at Blind Pass Beach which is right next to the bridge to Captiva on the Sanibel side. We wanted to make sure we didn't miss our only chance at a Sanibel Sunset. It was super low tide so we did quite a bit of shelling before watching the sunset. Bubble Room Cake - We made it back to the hotel in desperate need of showers, and once we were all warm and clean we had a pajama party and ate that yummy cake from the Bubble room. We tried both their Orange Crunch cake and their Chocolate Eclair cake and both were delicious, but the Orange Crunch was our favorite! This was our adventure day, to get out and see more of the Island. Holiday Inn Beach - we spent our morning (before checkout at 11) back at the beach. We shelled, swam, and Jacob had great fun filling up his bucket with water and dumping it out on us before running away laughing. Tarpon Bay Explorers Nature Cruise - Upon arriving back at Tarpon Bay Explorers we were very sweaty so we ate some ice cream and then waited for our tour to start. The first part of the tour takes place in their touch tank room where our guide taught us all about the animals in their touch tank - starfish, crabs, shellfish, etc. We got to touch them, see turtle shells and a dolphin skeleton up close, and learned a lot about the ecosystem here! Our guide was very knowledgeable and was able to answer everyone's questions. After that we boarded the boat and made our way out onto Tarpon Bay, which is on the east side of the Island. 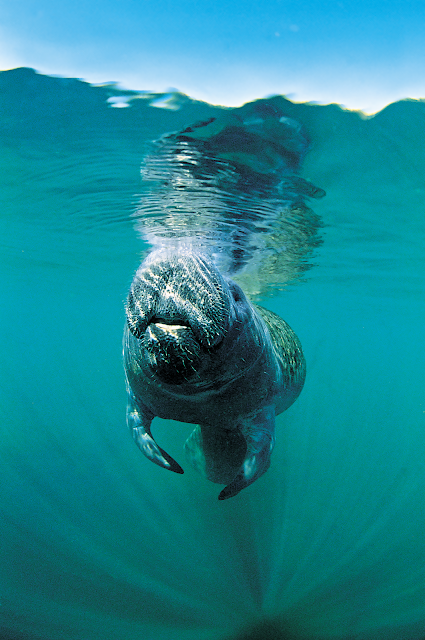 Sanibel is made up mostly of nature preserves, so the wildlife here is abundant. We got to see mangrove trees, a manatee, lots of pelicans, and a pod of playful dolphins during our time out on the boat. Bailey - Matthews National Seashell Museum - Our next stop was the National Seashell Museum where we got to see some of the largest shells I've ever seen! They had thousands of different shells in there, as well as a touch tank room, a craft room, and a movie theater. They also had a children's room with several kids activities like puzzles, exploration boxes, and a smaller touch tank. Jacob really liked it in there. Pinocchio's Italian Ice Cream - This was our last stop on our way out of town. We'd heard about their ice cream and it did not disappoint! Every cone and sundae is topped with an animal cracker, which is a cute touch. I tried their two signature flavors - Dirty Sanddollar and Sanibel Crunch, and liked both but the Sanibel Crunch was my favorite. Dirty Sanddollar is chocolate with malt balls in it and Sanibel crunch had coconut and almond slices. Jacob had some chocolate, that mostly ended up on his face, and Dan had a Key Lime Hurricane. It was starting to rain again at this point, and it continued raining our whole way home, but it didn't dampen our spirits. We talked most of the way home about what an amazing time we had and how we couldn't believe we hadn't visited before. I think we'll definitely be back in the future and maybe next time we'll check out the lighthouse, do some kayaking, and of course, search for more shells! 13 comments on "Kids Travel Guide: Sanibel Island"
Everything about your trip looks amazing! I absolutely love you mini and me matching swimsuits!!! Looks like you had an awesome trip! It looks like you had an amazing time! Cutest matching bathing suits! Love. Looks like a fabulous trip. Perfect way to end the summer! Wow - seemed like an amazing trip! We must go! What an awesome post. I feel like I totally can picture Sanibel now. I have always wondered if it would be a good spot to travel with kids. From your photos it looks and sounds like a very family friendly place. Love Sanibel - such a great family vacation spot. 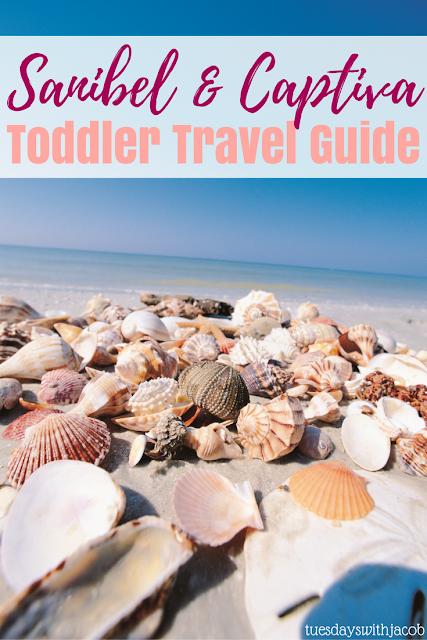 I go to Captiva every year and you mentioned every place that I must visit each trip! Bubble Room and Island Cow are my favorites! What an amazing trip!! Looks like it's a great place for families! Sounds like an amazing trip! I love that you were right on the beach- my fave place to be! With all that sand and water my son would be in heaven! What's in my teacher bag? What happened when I started taking care of ME.